Additionally, I have been dying to do this silly (? ), narcissistic (?) 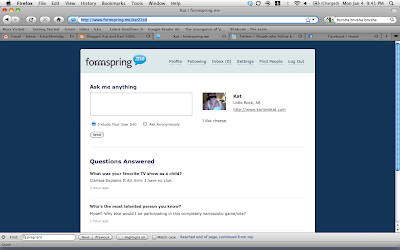 formspring thing that eleventy billion other people have been doing over on 'the Twitters'. ASK AWAY my friends. YOU CAN BE ANONYMOUS. (Or not.) (And I can choose not to answer you if your question is inappropriate or hurtful, but I will try to answer all questions openly and honestly.) I am also going to put a widget on my sidebar so you can ask whenever. I'm not really sure what I expect to take from this experiment, but LET US PLAY. your Apples to Apples card made me laugh. when I play with my cousins, Helen Keller is the trump card. awful, I know, but if it's played, you MUST pick it no matter how innapropriate. oh I love that game. I've tried to formspring you and it would not work. Boo. I will try again later. Last time I played Apples to Apples the game came to and end when both JFK and MLK were played to describe "explosive." Ouch! and yes I did play one of those.